Capapie Sports - About Us on your browser). We proudly present. CAPAPIE SPORT a company started by keen shooting enthusiast Mr. Vilas Rane in a effort to make indigenously manufactured equipment of international standard available to shooters in India. Timely suggestion by Mr. Nilesh Rane, former national record Holder has helped use gain the technical excellence thus, increasing our popularity in a short period of time. "CAPAPIE" is French word meaning a warrior who is covered and well equipped from head to foot, ready for battle. Likewise, we prepare shooters for their shooting battles. 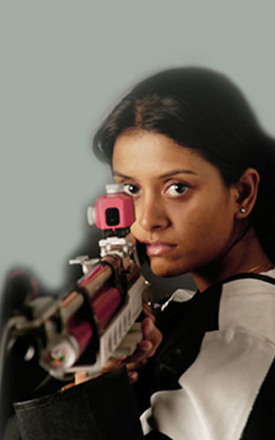 Capapie has been in the forefront for manifesting and supplying shooting equipments throughout India for over ten years. Our experience and expertise in the shooting field is second to none because of which our business is constantly expanding to serve clients throughout the world. We pride ourselves for the timely delivery of the most cost effective equipments, while maintaining top quality and the highest levels of after sale service. Our thoroughly professional and performance-driven approach has helped us gain a cutting edge over others. We are updating and upgrading our equipments as per the latest ISSF rules and international standards so as to satisfy the current requirements of world class shooters. Capapie will help you meet your goals, making you champions. Go Ahead!!! Shoot The Bulls-eye!!! To reach, support and upgrade each of our customer with world-class innovative products and excellent after sales support to help them achieve their goals. To be the most trusted brand globally, for world-class products and after sales services helping sportspersons in their journey towards excellence. We would always be committed to fulfill customer's expectation with a sole aim of helping him to achieve great heights in his sports career. Our whole time and energy would be exerted not only in doing work but doing just 'Disciplined Work'. Discipline should be an integral part of 'Work' and our 'Life'. We will give what it takes (GWIT) to create results. This means what may come we would raise our standards with an aim to take and deliver responsibility.